As the head of a bustling crafting retreat, Cora Chevalier could use a break of her own. So she and her creative cohorts temporarily swap small-town Indigo Gap for the Sea Glass Island Craft Retreat, where they teach classes and create beachy crafts like shell mosaics and sea glass chimes. Cora and her boyfriend Adrian are enchanted by their surroundings—especially the stunning wedding and blissful newlyweds they encounter on the beach. But awe becomes shock when the bride turns up dead the next day . . . The woman’s death appears to be the result of a severe jellyfish sting. But when it’s revealed that she was murdered and Adrian becomes a suspect, Cora must hitch the real culprit to the crime—and fast. Because it just might take everything she has to crack a case more twisted than her most complex macramé knot! Nothing can ruin a craft retreat quicker than a murder. Cora, Jane and Ruby have been asked to teach at the Sea Glass Island Craft Retreat. Thinking it will nice to have someone else in charge they accept. Who would turn down a beach retreat? Cara even brings her boyfriend, Adrian along. While checking out the beach they catch a glimpse of a wedding. Sadly, the next day the bride was dead and Cora is beyond shocked when Adrian becomes the prime suspect. Say What?? She is warned to let the police handle things but there is no way she is just going to teach her classes and relax on the beach with a drink in her hand while Adrian could end up behind bars. She will sift through every speck of sand on the beach to get to the truth. When I was in high school macramé was a big thing, I took a mini class where I macraméd a beautiful hanging table and some owls and plant hangers. I am thrilled this craft is being revived in fresh new ways. Mollie Cox Bryan sure has tied her characters in knots in this mystery. Cora and Jane are strong women, smart and gutsy too. They really don’t back down from a fight especially when one of their friends is in trouble. Cashel and Ruby are great assistants in the investigation. It is also nice that Cashel was available to serve as Adrian’s lawyer even though he gets a little prickly about having to work during his vacation. I loved the dialogue between all the characters, it was believable. Serious when need be but there are funny moments too. The mystery was difficult to solve with so many twists that brought more and more suspects to light and another dead body. I was excited when I figured out one major clue before Cora but I was really unsure of the actual murderer until the end. The suspense ratcheted up as we got closer to the end and the twists continued. A new element came to the forefront and Cora learned she had to trust the people around her, then things started to fall into place. Sea Glass Island, off the coast of the Carolinas sounds like a wonderful place, but a little over the top with mermaids 🙂 I would love to visit and if there was a craft retreat that would be an awesome bonus. This was a fun story. I love this crafting theme. It makes me long for the crafty self I used to be before my accident. I get to experience things I can no longer do through characters like these. That is what first drew me to cozy mysteries and it is why I continue to read them today. To find out more about Mollie Cox Bryan and her books and crafts visit her webpage here. Thank-you for the review. Love this series. 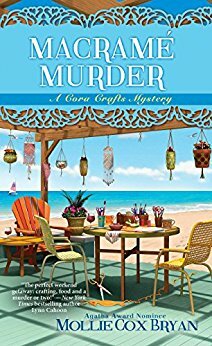 Thank you for hosting Macrame Murder on your blog. I love Mollie Cox Bryan’s series. Also thanks for the giveaway. I love a crafting theme on a cozy even though I’m decidedly uncrafty! I do love the sound of this one and the cover has been grabbing my attention since I first saw it. Great review! I really enjoyed Death Among the Doilies. Thank so much for a chance to win this one!